Sean Atkinson is an Assistant Professor of Music Theory at the Texas Christian University School of Music. Sean earned a Bachelor’s degree in Music Theory and Trombone Performance from Furman University, and a Masters and PhD in Music Theory from Florida State University. At TCU, Sean teaches a variety of classes in the music theory curriculum, as well as classes on multimedia analysis and post-tonal analysis. He is also a co-founder of No Quarters, a video game lab at TCU committed to the interdisciplinary research and teaching of video games. Sean’s research broadly address issues of musical meaning in multimedia. He has been published in Music Theory Online, Indiana Theory Review, The Dutch Journal of Music Theory, and Popular Music. His work on video game music has been presented at numerous conferences, including the North American Conference on Video Game Music and Music and the Moving Image. Japanese Role-Playing Games (JRPGs) have come to be known for their sometimes-formulaic plots, as is beautifully lampooned by this CollegeHumor video. Typical plot-points include: a great evil slowly taking over the world (often by collecting powerful crystals), a small team of unlikely heroes, playable characters that have secret past lives, sudden and unavoidable deaths of important main characters, and numerous side-quests (or minigames) that have largely nothing to do with the main plot of the game. Nonetheless, fans of JRPGs have come to love and expect these narrative devices as key elements, and some of the medium’s most successful and acclaimed franchises, including Fire Emblem (Nintendo, 1990-ongoing) and Final Fantasy (Square Enix, 1987-ongoing) series, fall into this genre. The music of these games is somewhat standardized across the genre as well, notably the use of rock-inspired themes during battle sequences and the often majestic nature of overworld music. Yet despite these similarities across the genre, the music of each individual game is complex, meaningful, and an essential part of the story. In fact, the music from these games has become so popular in its own right that it has enjoyed success outside the game, as evidenced by the success of live music concerts such as Video Games Live and, more specifically, the Distant Worlds concerts that exclusively feature the music of the Final Fantasy series. Nobuo Uematsu, the sole composer for the first nine Final Fantasy games, is known for creating themes in his music that reoccur often throughout the game. As Karen Collins (2008) points out, this helps players become more immersed in the world of the game (134). However, Uematsu takes further advantage of this musical repetition to enhance the narrative of the game as well. Indeed, his music complements and enhances plot-related decisions players make during the course of the game. For example, in a previous study of the music in Final Fantasy IV (1991), I show that the music associated with Cecil, the game’s main protagonist, is reused and evolves as the character transitions from the game’s anti-hero to the eventual hero. Music associated with Cecil as the Dark Knight begins as a menacing march in a minor key, but at the moment he becomes a Paladin the same theme is used again, this time as a fanfare in a minor key with flowing harp accompaniment. One of the more prominent examples of this musical transformation comes from the ninth installment of the series, in which the final scene unites two themes that are the centerpiece of the soundtrack, but more importantly, can be read as active agents in the narrative of the game. As a case-study for how composers can create rich and immersive environments through a game’s score, this essay explores the use of those two themes in Final Fantasy IX (2000), tracing how they are used, what meaning they carry, and how their transformations enhance and support the game. The story of Final Fantasy IX centers around the characters Garnet and Zidane. Garnet is the princess of the kingdom of Alexandria and her mother, Queen Brahne, is secretly plotting to take over the world. Zidane is a member of a group of bandits that is hired to kidnap Garnet and take her to the neighboring kingdom of Lindblum. Much to Zidane’s surprise, Garnet welcomes being kidnapped, as she was planning to run away to warn people about her mother’s actions. This is the beginning of Garnet’s and Zidane’s romantic relationship, which continues to develop throughout the game. Garnet is also a summoner, having the power to call on powerful monsters that can help during battles. Summoners are quite rare as Eiko, a young girl that Garnet meets about halfway through the story, is the only other summoner in the game. The grand musical finale of the game, known as “Melodies of Life,” joins together two themes that are only heard separately during the entire 20+ hours of gameplay. This musical event coincides with the sudden reappearance of Zidane and his reunion with Garnet. The two themes are closely related in terms of both melodic content and their use in the game (both signify important relationships for Garnet), but Uematsu waits until the very end of the story to bring them together. The song itself is remarkable in that it is the only track in the game that utilizes a live recording rather than sampled or synthesized sounds. The live voice adds a sense of poignancy to this emotional epilogue, even though fragments of the recorded vocal track are used during gameplay as well. The first theme of the song, “Eye to Eye,” is probably the most-used melody, featured in 10 other tracks in the game. Notable features of this melody are a prominent leap of a 6th and a descending line with repeated notes. The melody takes on several duties, acting as the love theme between the two principal characters Zidane and Garnet, the primary overworld music for most of the game, and the music that helps to connect Eiko and Garnet as summoners. This is the melody that players are most likely to walk away singing or humming after playing for a few hours. The theme itself is fairly simple and presented in a similar style in each of its iterations during the game. The only exceptions are a dramatic escape cutscene in which Zidane and Garnet narrowly escape Steiner at the beginning of the game and the simple, folk-style setting of Eiko’s themes. The theme is centered around Garnet and helps define two important character relationships. The first is the romantic relationship between Garnet and Zidane. The musical setting is lush and romantic, featuring a string orchestra and the simple melodic line played on flute. The texture is delicate, but at the same time solid and well-supported. The complete tune is first heard in a scene in which Garnet reveals her true identity to Zidane, cementing the relationship and strongly tying the tune to their budding romance. “Eye to Eye” also helps to connect Garnet to Eiko, a character that is introduced about halfway through the game. Eiko, like Garnet, is a summoner who can call on monsters to help during the game’s battles. Garnet and Eiko are also the last of their kind, which further enhances the bond between the two. Eiko’s themes are based on the same melody that connects Garnet to Zidane, though the style is decidedly non-romantic. The simple guitar-strummed accompaniment in a lazy swing coupled with high-pitched bell sounds (similar to Montessori bells) gives the tune a playfulness that is appropriate given Eiko’s young age. The melody is present in many other guises as well, either overtly, as with the game’s overworld music, or more discreetly as a small fragment with another theme. But this is undoubtedly the main melodic idea for the game. The second half of “Melodies of Life,” called “Song of Memories,” is a similar theme to the first. Like “Eye to Eye,” it contains a large melodic leap of a 6th and shares the same pattern of repeated notes and descending gestures. But Uematsu is much less generous with his use of this theme, giving it an elusive quality. Highlighting its elusive quality, Garnet sings the theme several times during the game, but doesn’t remember when she learned it or where it came from. The theme first appears early in the game when Zidane hears the song, but can’t track down the source. Later, he hears the tune again and discovers that Garnet is its source. Unlike the previous melody, this tune is solely Garnet’s as she is the only character that sings it and, apart from the above-mentioned instances, it is only heard again when Garnet is crowned as the new queen of Alexandria. It is also worth noting that this theme is diegetic, meaning that it exists within the world of the game, heard by characters as well as the player. On the other hand, we can assume that “Eye to Eye” is nondiegetic as characters never refer to it. For the majority of the game, players hear and understand these two melodies separately. “Eye to Eye” comes to be one of the primary melodies of the game, and likely the tune most players will remember. However, it specifically links Zidane and Garnet’s romantic relationship and Garnet and Eiko’s spiritual relationship, while “Song of Memories” relates to Garnet’s character alone, and is possibly a link to her forgotten past. Importantly, Garnet lies at the center of both themes, which is why the game’s finale music becomes so powerful. It is literally a song from Garnet’s past, joining with Zidane’s voice to become their song in this final, combined form. The function of video game music varies widely from game to game and amongst video game genres. Collins discusses many of these functions in detail in chapter 7 of her book Game Sound, including diegesis and the level of interactivity a player has with the music (125-133). Tim Summers (2014), also touching on the Final Fantasy series, likens the use of music in RPGs to that of leitmotifs in Wagnerian opera (207-208). These recurring musical themes stand in for and represent characters, actions, or items in a game and can alert the player to the importance of those objects even if not presently on screen. As I have demonstrated, the first of the “Melodies of Life” themes fulfills its operatic leitmotif role as a marker for Garnet’s relationships with Eiko and Zidane. In addition, the combination of the first and second musical themes helps craft a powerful ending to the game, as the uniting of the themes correlates to the climactic reuniting of Garnet and Zidane. There is, of course, more thematic complexity in the game’s music that I have not mentioned. Jessica Kizzire (2014), for example, discusses the use and reuse of the game’s title music as a signifier of nostalgia (183-198), and Vivi’s theme is almost as omnipresent as “Eye to Eye,” subject to its own stylistic transformations that support the plot. 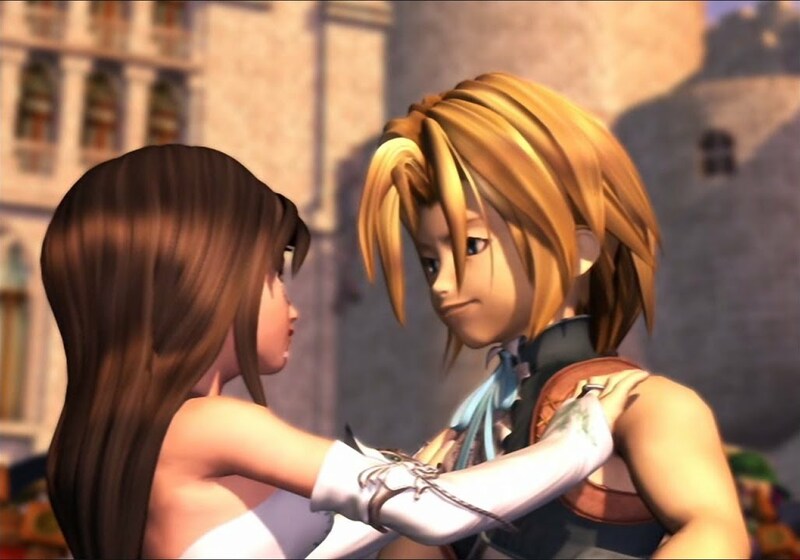 The music of Final Fantasy IX does more than just provide a passive background for the game: Nobuo Uematsu’s score actively participates in the narrative, helping in this case to tell the romantic story of the game’s main characters. Music in narrative-driven games plays a crucial role in helping to develop important plot points. Subtle changes in the way a theme is styled, or sudden reappearances of a theme, can have a dramatic effect that adds richness to the story. The interactive nature of video games makes these effects even more pronounced, as players can make decisions based not only on what they are seeing, but also on what they are hearing. An altered theme in a film soundtrack might provide a clue to a savvy viewer, but that viewer can only observe to confirm that suspicion. The same altered theme in a video game allows a player to react to it, possibly affecting the eventual outcome of the story. JRPGs provide an ideal environment for music to provide a supporting narrative that enhances and contributes to the game’s plot. The narrative may be formulaic across the genre, but the music enhances the story and helps to create a unique and emotional experience in every game. Almén, Byron. A Theory of Musical Narrative. Bloomington: Indiana University Press, 2008. Bradford, Wesley. “120 Shrines which are Related Only with One Another: Modernist Style and Neo-Narrative.” Presented at the North American Conference on Video Game Music, January 13, 2018, Ann Arbor, MI. (last accessed June 11, 2018). Collins, Karen. Game Studies: An Introduction to the History, Theory, and Practice of Video Game Music and Sound Design. Cambridge: MIT Press, 2008. Collins, Karen. Playing with Sound: A Theory of Interacting with Sound and Music in Video Games. Cambridge: MIT Press, 2013. Gibbons, William. Unlimited Replays: Video Games and Classical Music. Oxford: Oxford University Press, 2018. Kizzire, Jessica. “’The Place I’ll Return to Someday’: Musical Nostalgia in Final Fantasy IX,” in Music in Video Games: Studying Play. Ed. K.J. Donnelly, William Gibbons, and Neil Lerner. New York: Routledge, 2014. Said, Edward. Music and the Limits. New York: Columbia University Press, 2008. Summers, Tim. “From Parsifal to the Playstation: Wagner and Video Game Music,” in Music in Video Games: Studying Play. Ed. K.J. Donnelly, William Gibbons, and Neil Lerner. New York: Routledge, 2014. TheShroud13. “Final Fantasy IX Original Soundtrack: Review.” Square Enix Music Online. (Last accessed October 4, 2018).